Sydney Ideas is pleased to host an evening with Egyptian writer Ahdaf Soueif, in conversation with the University of Sydney’s Lucia Sorbera. 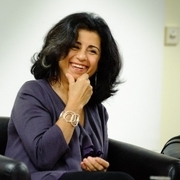 Soueif will discuss Egyptian literature and role of women in the Arab Spring, will read from her body of works, and sign books after the event. Ahdaf Soueif is the author of the bestselling novel The Map of Love Map of Love (shortlisted for the Booker Prize in 1999 and translated into 28 languages), as well as the well-loved In the Eye of the Sun and the collection of short stories, I Think of You. Soueif is also a political and cultural commentator and writes regularly for The Guardian in the UK and has a weekly column in al-Shorouk in Egypt. Most recently she has published her eyewitness account of the events in Cario during January 2011, Cairo: My City, Our Revolution. Ahdaf Soueif is in Australia as a guest of the Perth Writers’ Festival and Adelaide Writers’ Week. Join us for a reading group discussion of The Map of Love by Ahdaf Soueif! In 1901, far from the comfort of the British colony, Anna Winterbourne, recently widowed, finds herself enraptured by Egypt and in love with Sharif Pasha al-Baroudi. Nearly a hundred years later, Isabel, a divorced American journalist, journeys to Egypt to learn about her heritage and a difficult man. Ahdaf Soueif is currently considered a "single author." If one or more works are by a distinct, homonymous authors, go ahead and split the author. Ahdaf Soueif is composed of 7 names. You can examine and separate out names.